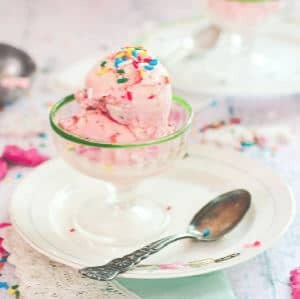 If you loved those sweet, frosted circus animal cookies as a kid then this pretty pink ice cream recipe will be a favorite! 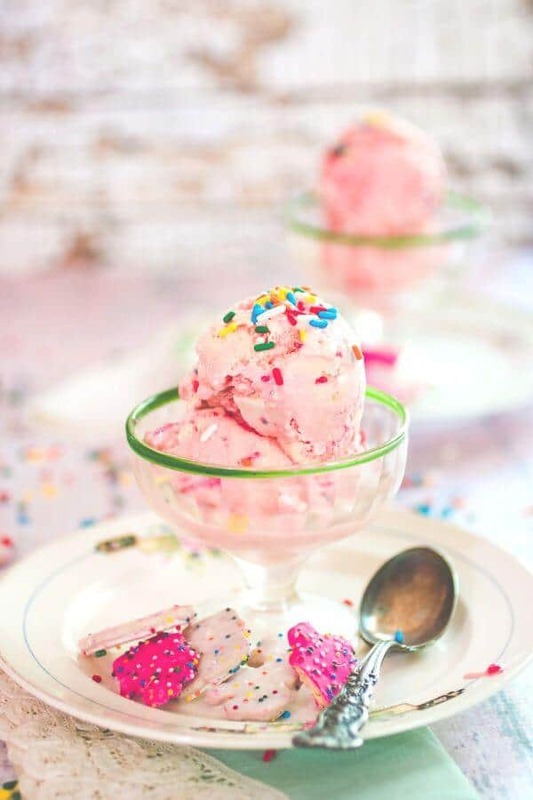 Rich, super-premium style vanilla ice cream has chopped up pink and white circus animal cookies as well as a plethora of colorful sprinkles added to it. It’s perfect for Valentine’s Day, birthdays, or any time you need a pink dessert! Miss Smith was the most beautiful woman I had ever seen. She wore white lipstick, blue eye shadow and her dark hair was cut short (Twiggy style) with a short “c” right in front of each ear. She wore mini skirts and white boots and smelled like sweet flowers. She also brought Circus Animal cookies to school to give us at lunchtime. I’d never had those little bites of sweet, frosted goodness before and I was addicted. I had every intention of wearing white lipstick and eating mountains of Circus animal cookies when I grew up. Sadly by the time I was old enough for lipstick in 1974 white lipstick was totally out of style and I carried flavored roll on “Kissing Gloss” in my purse like everyone else. But I still had a secret passion for pink and white frosted animal crackers. Add a few drops of almond extract to vary the flavor of this homemade ice cream recipe. How do you make a good homemade ice cream? Don’t skimp on the fat! Good homemade ice cream is high in fat! But if you use too much fat you risk ending up with frozen butter. It’s important to follow the recipe and use the mixture of cream and milk called for. Why is my homemade ice cream icy? Homemade ice cream turns icy because there is too much water in the mixture, allowing big ice crystals to form. This happens most often when the ingredients aren’t measured properly or you try to cut back on fat or sugar called for in the recipe. Why is my homemade ice cream grainy? Ice cream gets grainy when it melts and refreezes or if the ice crystals are too large. Be sure to follow manufacturers instructions for freezing and store, tightly covered, in a freezer. How long does homemade ice cream last? Ice cream is at its best within two weeks of being made. It is perfectly safe to eat after that but it does lose quality. If you are looking for a pink ice cream recipe it just doesn’t get better than this. 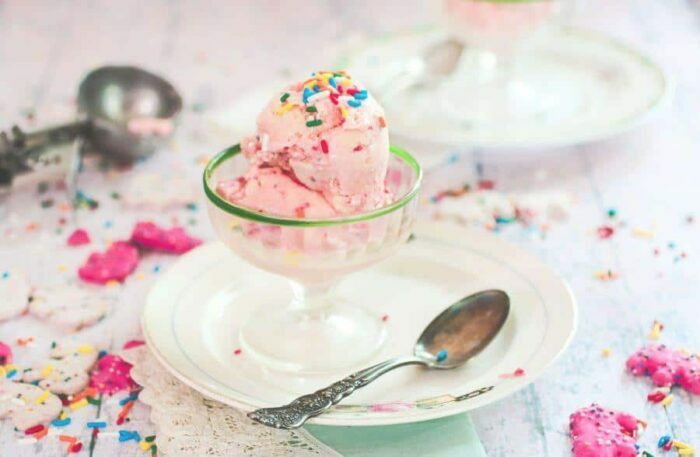 Creamy vanilla ice cream that’s exactly as pink as you want it… bites of crunchy circus animal cookies, and loads of sprinkles – who doesn’t like sprinkles? It’s an easy recipe but here are some tips to make sure it’s delicious every single time. Use the freshest, highest quality ingredients you can get. Split the vanilla beans in half before adding to the milk to get the most flavor. Save the empty pods after use to be added to a canister of sugar for vanilla sugar. Chill the base mixture before freezing. 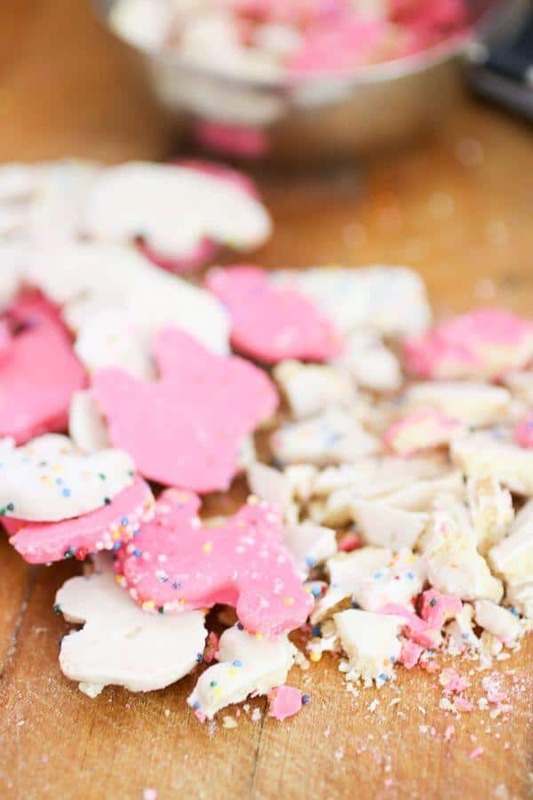 Add the circus animal cookies and sprinkles when the ice cream has thickened but isn’t completely frozen, or as your manufacturer directs. If you’d like a swirled effect with the pink color add the food coloring when the ice cream has thickened instead of in the beginning. After it’s finished in the ice cream maker pack it firmly into a freezer safe storage container and let “ripen ” in the freezer overnight. Store leftover ice cream in the storage container with a piece of plastic wrap pressed firmly over the top. I absolutely love my Breville Ice Cream maker! It’s got it’s own compressor and freezing system so you never need salt nor ice. Love homemade ice cream? Me too! Here are more of my favorite ice cream recipes. 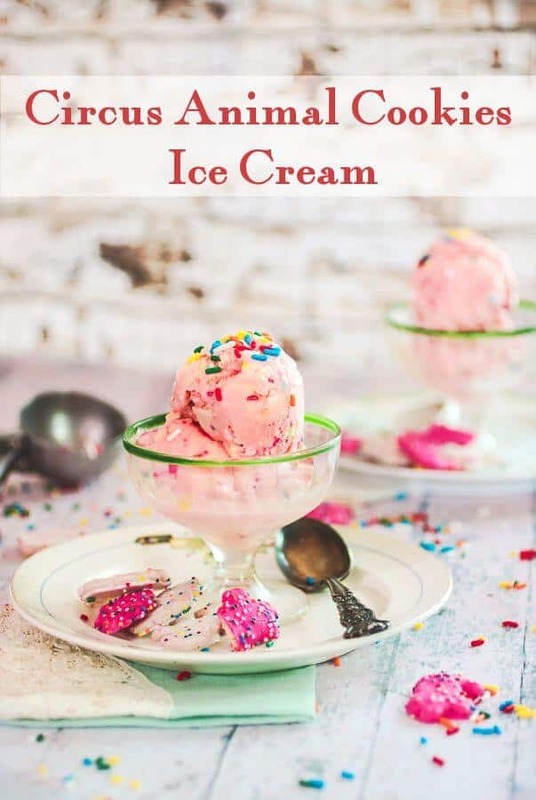 And this is a great tutorial from Handle the Heat for how to make ice cream without a machine. Vary the sprinkles according to the celebration! Creamy, pink, super-fatted ice cream that’s perfect for birthday parties and more. If you love this recipe please give it 5 stars. Sweet and rich, this pretty pink ice cream has pieces of crunchy frosted circus animal cookies throughout. It’s perfect for any celebration! Beat the egg yolks and sugar until very light and the sugar crystals can’t be felt when you pinch a little between your thumb and forefinger. Combine the milk, cream, and vanilla pods in a heavy saucepan. Turn heat to medium high and cook, stirring occasionally, until the mixture comes to a simmer and bubbles form around the edges of the milk mixture. DO NOT BOIL. Remove the vanilla pods and scrape the seeds into the milk mixture. Save the pods to use to make vanilla sugar, if desired. Add a little of the hot liquid to the egg yolks, beating constantly. Continue to add the hot milk mixture to the egg yolks while beating – make sure the eggs don’t curdle. If you think you’ve curdled some of the egg pour the mixture through a strainer to catch any cooked egg. Return the custard mixture to the saucepan and place over low heat. Cook, stirring, until the custard coats the back of the spoon and your finger leaves a track. Make sure it doesn’t boil. Let cool to room temperature then stir in the vanilla and food coloring..
Pour the cooled mixture into an ice cream maker and churn according to manufacturer’s directions. If your ice cream maker allows different settings use the “gelato” setting or slow churn setting. When the ice cream is thick, just before it’s completely done, add the sprinkles and the cookies. Continue to churn until done. Remove from churn and pack tightly into a freezer container. Seal and freeze overnight for best texture and results. Part of Meal Plan Monday!